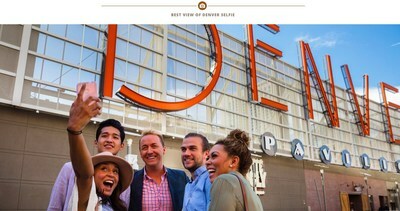 DENVER, Sept. 26, 2018 /PRNewswire/ — Denver Pavilions, the city’s largest downtown Denver retail, dining and entertainment center is the best-known place to snap the ultimate Denver selfie. With its supersized red letters spelling out “DENVER,” the sign is affixed to a massive wall, colorfully lit at night, linking the two-block development. The sign has become a widely recognized symbol for the Mile High City. To get a selfie with the sign, visitors can follow the red arrows from the ground level of the Denver Pavilions, up two sets of escalators to the third floor.